Connectivity is not uniquely about industrial devices and machines, but more importantly, it is also about connecting to the client’s specific needs via IDX product support services. A week ago, an Netbiter EC250 was brought by a customer to the IDX team for firmware update and, of course, we were glad to assist him. But first, let us briefly introduce the Netbiter EasyConnect EC250 or as abbreviated EC250. The Netbiter EC250 belongs to the Netbiter EC200 series industrial gateways family. It offers connectivity to the Netbiter Argos server (data storage centre in the “cloud”) via Ethernet/GSM and GPRS network technologies. The device, viable and versatile, is well suited for remote access monitoring, management and control of Modbus field devices connected to it (both MODBUS TCP device via Ethernet and serial device via RS232 and RS 485). Once subscribed to the Netbiter Argos via www.netbiter.net , myriads of Argos services can be accessed. The inherent competitive nature of industrial communication field is ever pushing for new innovations and services which aim at responding (satisfying) industry needs while ensuring and maintaining an uncompromised network integrity and data reliability via Netbiter Argos. In this regard, HMS, offers firmware updates for their Netbiter products. 1. First, establish a physical connection between your configuration station or tool (computer) and the Netbiter EC250. Using a null modem RS232 cable, connect the Netbiter EC250 to the configuration station (your PC). This connection is generally termed “direct connection”. 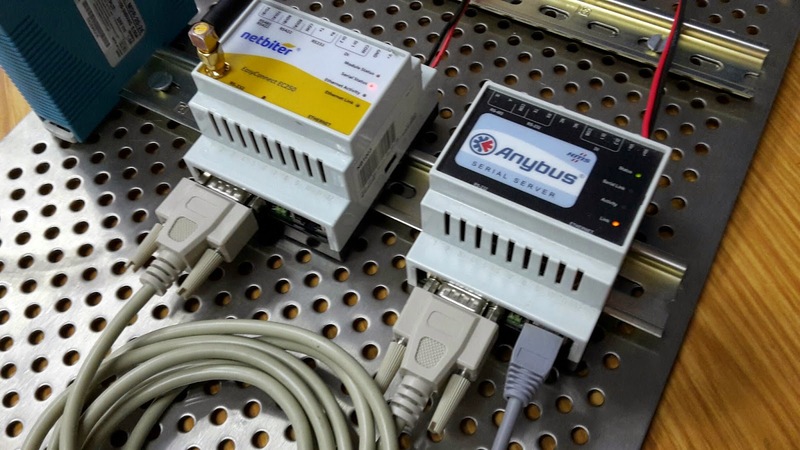 If a direct connection cannot be established, a serial (RS232) to Ethernet cable adapter like the AB7701 Serial Server from Anybus can be used. 2. Open the www.netbiter.com page. The main web page or “welcome page” will appear which contains links to the Netbiter EC250 product either by clicking on “product” (bar menu) or using the search option box (top right hand corner) or through scrolling down the page where the Netbiter EC250 is clearly showcased. 3. Then the following page will appear. On the right hand side of the page, a link to the firmware download page is provided. Click on the “File download" link. In the file settings section of the window, upload (click the browse button) the kernel.nbu file first, then follow the instructions as they appear on the bottom part of the update page. During the configuration process, it is required to power off the Netbiter, then power it on again and click the “start programming” button (bottom of the page). The same procedure must be followed when the EC 250_v#.#.nbu file is uploaded. The programming progress is indicated by the blue bar at the bottom of the update page. At the completion of the programming, please reboot the unit. It is worth noting that during this process, COM port numbers as entered in step 5 may not allow communication between the configuration computer and the Netbiter EC250. To ensure that that the correct port number is used; first match the port number as seen in the device manager utility of the configuration tool with the one that is entered in the Netbiter update window. If this this does not still allow any communication to take place; please ensure that the serial/USB/Ethernet driver is correctly installed and configured. Now, to complete our story, the client can go and attend to his pressing projects at various locations or sites with confidence in his newly acquired skills as far as Netbiter EasyConneEC250 is concerned. Once again, the IDX Team lives up to the firm’s reputation of providing reliable product support.